We offer a range of Carbon Brushes Differential pressure switches like Varma tarfag, Astrix, Indfos, Orien Pressure. 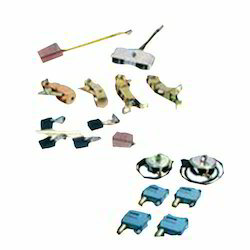 Switches are assembled in spinning, Combar, and simplex. Carbon Brushes: All type of carbon brushes for over head cleaners DC Motors, Generators etc. Pressure Switches: Differential pressure switches like Varma tarfag, Astrix, Indfos, Orien Pressure. Switches are assembled in spinning, Combar, simplex, compressors and generators.